Earlier this week, we just reported that the much anticipated Xiaomi Mi4 will be officially announced on July 22nd next week. 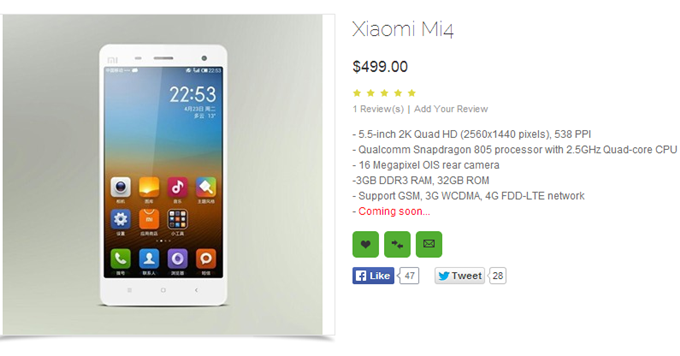 Today, a tipster named Jay has sent in a product listing of the upcoming Xiaomi Mi4 along with its official render as well. According to the listing, the Xiaomi Mi4 comes with a price tag of just $499, much cheaper than what we expected to be honest. The device will sport a 5.5-inch QHD display (similar to that of the LG G3), powered by an incredibly 2.5GHz Snapdragon 805 chipset with 3GB RAM. Other impressive features include the 16MP Sony OIS camera at the back, as well as a 5MP shooter at the front for selfies. This time round, the Xiaomi Mi4 will be supporting the 4G LTE network bringing extra joy to the users. Unlike other Xiaomi smartphones, the Mi4 is equipped with a powerful 3,200mAh battery to increase the fun. Lastly the tipster also confirmed with us that the Xiaomi Mi4 will be arriving in Singapore and Malaysia somewhere during mid-August, so stay tune for more updates!